• Happy Birthday to Us! JOBotz makes AI bots in game Joint Operations behave dynamically. Nothing is pre-scripted, the addon figures out where to move the bots. The addon manages the targets where to send the bots and does its own path-finding. Since there is no extension API for the game Joint Operations, the amount of information that the addon has access to is minimal. That means that the offered funtionality of the addon is limited, so don't expect some clever behavior from the bots, or perfect pathfinding. ° The addon requires around 500MB of memory for its own purposes, depending on map size and complexity. ° Some of the calculation is CPU intensive, if this proves to be a problem for someone using the addon, i will try to implement possibilities to limit CPU usage. ° Install Java 8 from www.java.com. ° Make a new folder of your choice. For example C:\Games\JOBotz. ° Extract the ZIP file to the new folder. ° Copy the files from "maps" subforder to where your Joint Operation game is installed. ° Start the addon by doble-clicking the "jobotz.cmd" batch-file. ° A message will appear repeatedly in the console: "Waiting 3 sec for JO process"
° The addon is ready to interact with the Joint Operations game. ° Start the game, you can start a LAN game or connect to Novaworld. ° You can use both dedicated serving and serve&play. ° If you intend to play alone, host a LAN game in serve&play mode. ° This is alpha software, so you might lose time trying to get it work, or it might crash. ° The bots might not be as fun to play as expected. Somalian Conflict brings almost all of the Black Hawk Down/Team Sabre stuff to Joint Operations engine, that includes vehicles, AIs, weapons, HUD, buildings, decorations, terrains and environments. If you want to experiment how would it feel to play black hawk down with the JO engine, this is your mod. Click here for more info about this mod. Since there are a lot of people still wanting to host stats for Joint Operations, I've managed to fix the code base for JOStats so that it works with PHP 5.6+. There were a ton of edits but it's now fully working on PHP 5.6+ so you no longer have to find a host with PHP 5.2 to run stats. Please make sure you read the Readme-NovaHQ.txt file before you install or upgrade your stats. It has all the information you need to install / upgrade your JOStats. If you need more help, please post in the forums >>HERE<<. THORS THUNDER are holding another Map Making Comp. Winners Name will be posted on LST and THORS THUNDERS web site front pages. All maps will be hosted on LST & Thors Thunder Servers. All maps must be submitted with map makers Email. You may post a 'Reply' to this post that you have or are going to submit a map. And Winners Name will be posted on THORS THUNDERS web site front page. Top maps will be hosted on Thors Thunder Servers & LST Servers. Maps must be for the JOIC Mod. Maps must be clean in content. Maps must be Original Work and New - no remakes. 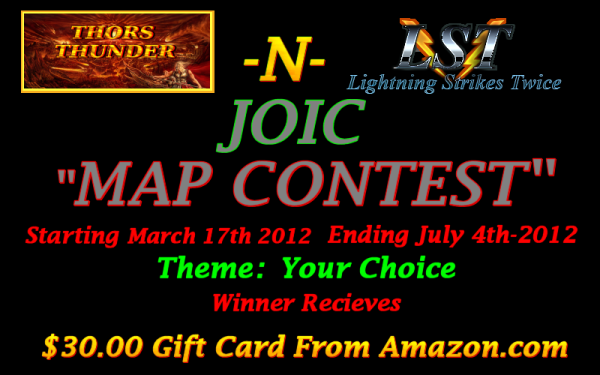 Maps must not be posted on any other site before the end of the contest. Judges can not Submit a Map. Any map not meeting these rules will be disqualified. division of prize is up to mappers not THORS THUNDER. LST or Thors Thunder will not Host Test any of these maps. not consisting of any of the Judges. for download by the Public. All Maps will be Posted for download if played with out problems. (Sorry for the slow news, thought i already posted it). Please bare with us, as it will take a few days to get the update out to all our affiliates and for all private and public servers to be updated. Quote by The Kyle from NW2 forums. "Note: This EXE will force a vidtest. For those technical enough to back up their current EXE and copy this one to the right folder, you can test it out for us. It's intended to be compatible with the current EXE and offers a few new features and improvements. Pending the test results, these changes will become available as a regular update. This is a Full installer, the patch has been revoked due to an error. If you have used the patch to update your V1.0, please uninstall and install this full version. Loads of optimised textures to help with resource usage. Retro Jo items reworked and added. Stock JO maps converted and included in patch. Also 60+ Coop maps have been converted and uploaded to the SGMOD georgia server. If a new MOD is release would you try it?